Chado is the art of serving powdered tea, but it is not just about drinking tea. It's the culture of hospitality, considering guests, the season, time and place and the occasion. Jaku (Tranquillity): to acquire calm and peaceful state of mind after having prepared oneself to deal with all eventualities. The two young Viet-namese slowly re-ceive tea bowls from their Japanese host, bow to each other and then raise the bowls in a gesture of respect to the host. Before taking a sip of the green powdered tea, they rotate the bowl to avoid drinking from the front, and then clean the rim of the bowl. The procedure is repeated until all guests have taken their tea in a purpose-built room decorated with screens and a large umbrella printed with Japanese patterns. Seated at the front close to the host, the girls practice the role of main guests during a demonstration of the Japanese tea ceremony, or Chado, in Ha Noi. The event is hosted by a group of eight Japanese women who call themselves the Urasenke Chado Circle in Ha Noi. Urasenke is the name of one of the main schools of tea ceremony in Japan. 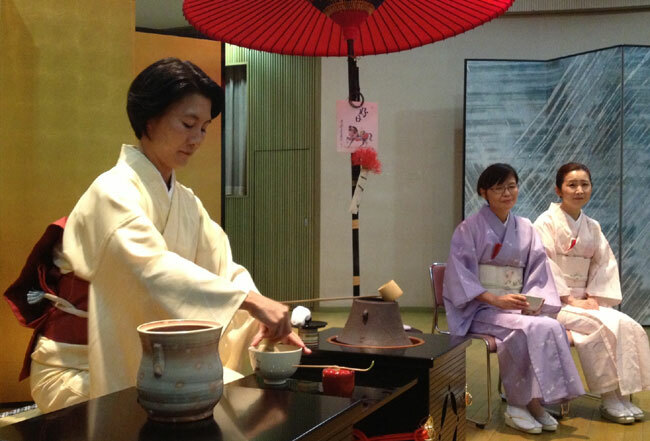 Chado has been translated as "Tea Ceremony" in English, but actually it literally means "The Way of Tea". "We teach Chado to Vietnamese in Japanese once a month. We hope some of them will become a core member of our group because we expats are always moving," said Chiharu Iseri, a doctor of sociology who is in charge of the group's public relations. "In HCM City, there is a Urasenke Chado society with Vietnamese who learned Chado in the old Japanese royal capital of Kyoto. We are dreaming of such a future [in Ha Noi]," said Chiharu, her eyes filled with hope. Chiharu gave up practising Chado months after she arrived in the capital because she did not bring enough utensils to make a cup of Japanese-style tea. However, things changed when she met a Japanese teacher, Soko Gohbara. "I remember when I entered the teacher's apartment for the first time. It was quite amazing to see the room was filled with her adaptations of Vietnamese ceramics to the ancient Japanese custom," Chiharu recalled. "I enjoyed the way she did things and learned that the most important thing is to practice." They started practising Chado in Ha Noi in April, 2012. At first there were only three members of the Urasenke Chado circle. They practised it in Soko's living room because there was no Japanese tea-room in Ha Noi then. "After a while, the Japanese Embassy asked us to do a lecture and demonstration for Vietnamese teaching or studying Japanese. We thought it was a good idea as it was the 40th anniversary of diplomatic relations between Viet Nam and Japan. We wanted to deepen our relationship through Chado," said Chiharu, a part-time lecturer at universities in Japan. Since then, the group has given lectures and demonstrations on Chado to Vietnamese and Japanese four times a year at the embassy. Its members also teach Chado to Vietnamese in Japanese once a month at the Japan Foundation in Ha Noi. They also practice themselves every Tuesday. "The most important fact in Chado is to keep practising in order to gain spiritual insight, not just learning procedures and techniques," said the group's leader Michiko Tarumi when asked how long it would take a person to master the techniques. "Of course, every learner has to study the knowledge and techniques behind the custom, but we don't regard these as the goal. "Since we think it is The Way, we keep practising it to improve ourselves as long we as live." According to Chiharu, a leader is selected by the members according to her experience and possession of a tea making certificate. A person who has the highest certificate becomes leader of a group. The Urasenke school in Japan sets seven steps for a beginner to graduate to teacher. Though she has practised Chado three times a month for eight years while she was in Tokyo, it was still not enough for her to complete her certificate. "I did not have time to join many tea ceremonies. Normally it takes 10 years to know the techniques. Nobody could say ‘Now I master the Chado' as it is an endless learning," said Chiharu.